Home > For Everyday Use > What is the Best Brand of Backpacks You Know? Shopping for backpacks can be challenging when you don’t have enough information about the product. You may have no knowledge of whether the backpack you are about to buy is made of the right material, made for the same purpose you plan to use it for, has the design and size you want or whether it suits you in terms of the intended age group, color, and usage conditions. You may also have no knowledge whether there are some other sizes, colors, and designs of a certain backpack brand that you find in the market. It is, therefore, advisable that you do a little research about popular backpack brands before you go looking for one. Make sure to read it in order to make the right decision next time you go shopping. Here, I give you the best products the brands have to offer. So, in a way, what I give you is the best of the best. 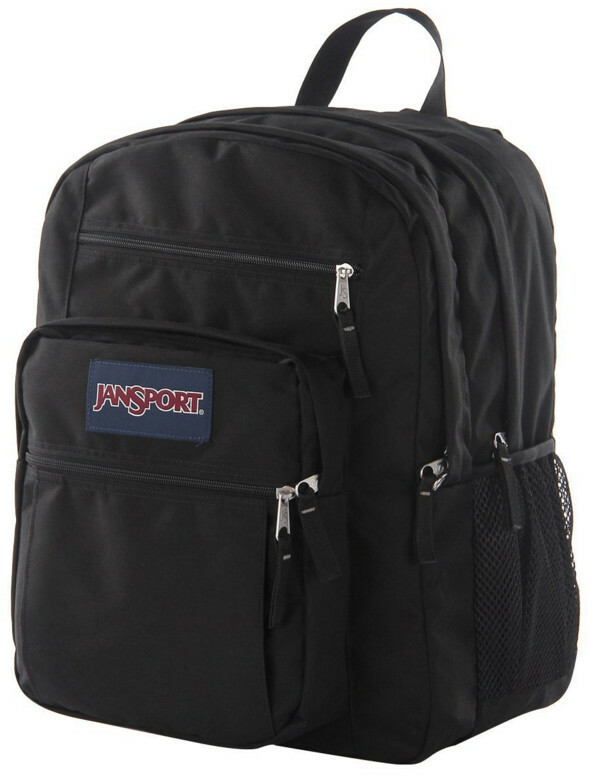 Founded in Seattle in 1967, JanSport Big Student Classic Series Daypack is a world-class unisex backpack brand. Their backpacks have many potential uses, just as many other daypacks. It is a popular backpack brand among big-bodied middle school students as well as high school and college students, but their products can also be used by adults for hiking and short-term travels. By the way, if you want a backpack for a high school or college student, you should check out my reviews: for school and for college respectively. The backpack is comfortable to carry and made of a tough polyester material, with stout zippers and strong stitching so that they last long. In total, the JanSport Big Student Series Daypack has five pockets, a built-in sleeve for holding laptops or tablets, a side bottle pocket, and front organizer pockets for holding pens, keys, phones or any other objects of the kind. Its shoulder straps are strong and adjustable to fit many body sizes. Two of its pockets are large enough to carry a number of books, gym clothes, a-few-days-travel clothes, and hiking materials, as well as toiletries and lunch boxes. Its front utility pocket is combined with an audio electronics organizer that keeps the essentials at hand. The backpack exists in more than sixty colors, meeting the expectations of anyone who holds the color as a priority. It has the volume of 2101.7 cubic inches, the height of 17.5 inches, the width of 13 inches, the depth of 10 inches, and weighs 0.68 kg. The JanSport Big Student Classic Series Daypack is durable, mainly because of its strong polyester materials, sturdy zippers and strong stitching. Interestingly, despite its durability, elegance, and many potential uses, the product is sold for only $46.95 and is always available for sale. Click here for the latest pricing details about it! The High Sierra Swerve Backpack is a classic backpack suited for various uses. It is mainly used for travel and hiking, but can also be used for carrying books and other learning materials. 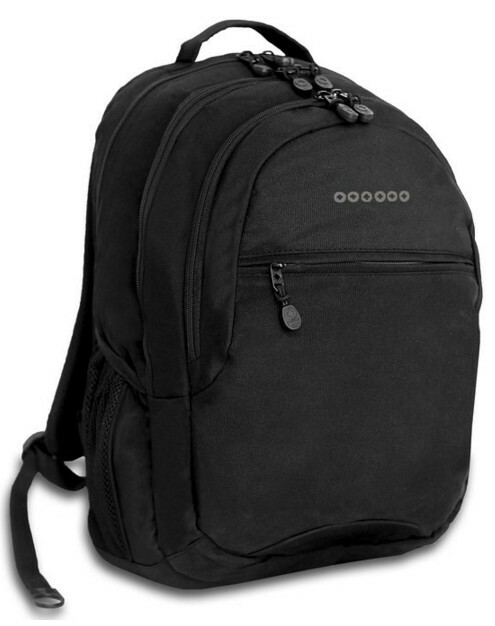 The backpack has a multi-compartment design with two side bottle meshes and a built-in laptop sleeve fit for laptops with the dimensions of 15.5 x 10.75 x 1.8 or less. It has two S-shaped padded straps with suspension systems and thumb-ring pulls. It also has an easily accessible deluxe media pocket that can hold phones, PDAs, and MP3 players of many sizes. The product is also customized with a CD player pocket with a headphone port that allows you to enjoy music while traveling. It is a durable backpack made of a tough nylon material and with strong zippers and quality stitching. It also exists in many colors, making it possible for you to choose a color that you like. 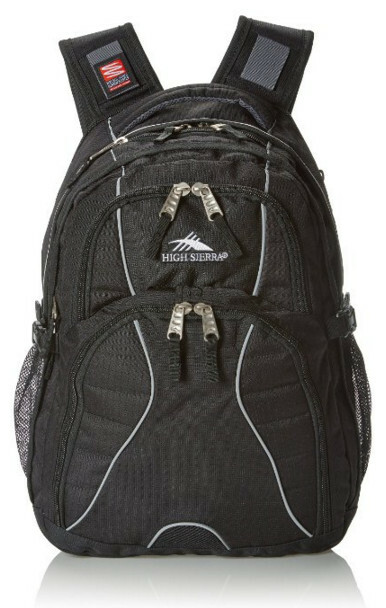 Interestingly, a High Sierra Swerve Backpack is sold for as low prise and is always available upon request. The Nike Hoops Elite Max Air Team Backpack is known for its durability, impressive volume, water resistance, and light weight. It is made of a 100% polyester material, an air-form shock-absorbent, water-resistant tarpaulin, as well as with stout zippers and strong stitches that make it very durable. It has a dual-zip and spacious main compartment, two other small pockets and a mesh bottle side pocket. The main compartment has the inner volume of up to 30 liters and has dimensions of 20 x 30 x 9. 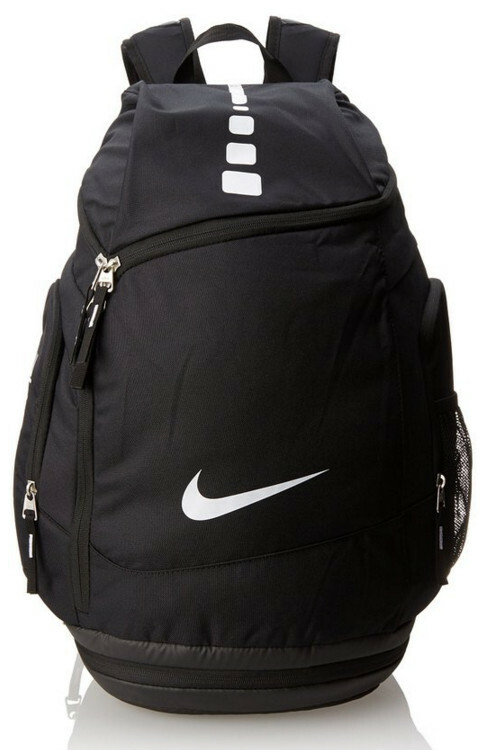 It is mainly used during sports events and traveling, but can also be used as a school bag. The backpack comes in many colors, which allows you to choose the color you like. Its price is also wallet-friendly. The Osprey Farpoint 40 Travel Backpack is lightweight and has a streamlined shape, ideal for fast-moving globetrotters. Despite its light weight, the backpack is very spacious and can hold a laptop with the screen size of 15 inches or less. The backpack has a front zip main compartment for holding large things such as clothes and toiletries, two small zip pockets with key fobs for holding small objects, and dual mesh pockets ideal for holding bottles and snacks. This backpack is ideal for long-distance travel and flights because of being lightweight and its ideal shape that allows it to fit perfectly on your back. There are many color varieties of this product available to make sure that you don’t miss the color you like. 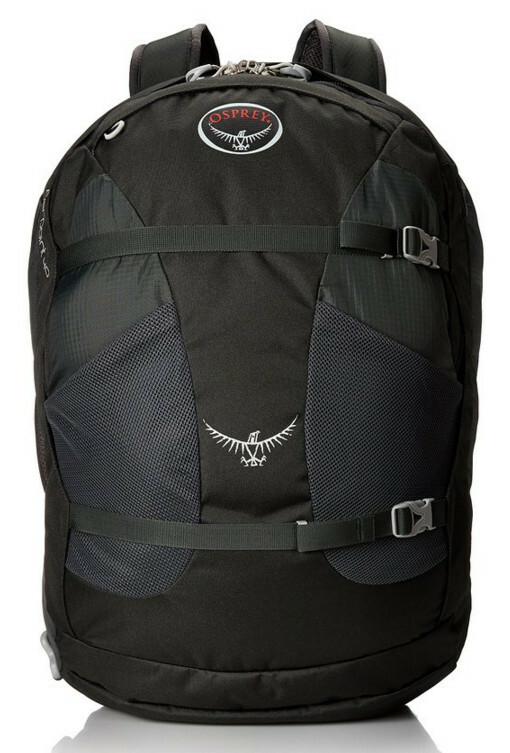 Surprisingly, the Osprey Farpoint 40 Travel Backpack is sold for as low prise and is always available for shipment upon request. 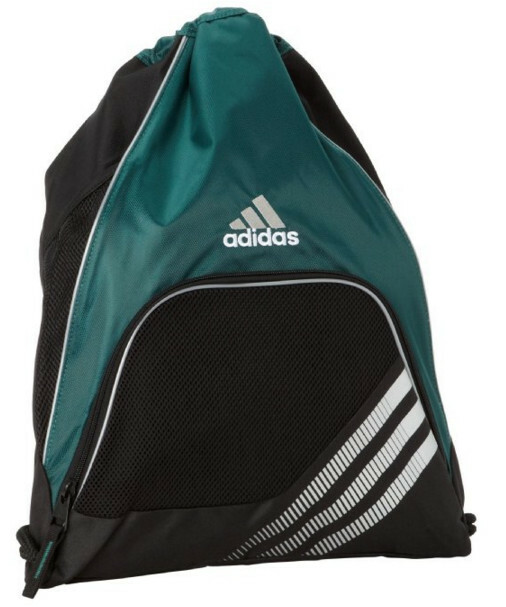 The Adidas Team Speed II Sackpack is combined with a large ventilated zip pocket that keeps your stuff fresh. It also has two front mesh drop pockets suitable for holding many types of bottles and snacks, and a string-drawn main compartment, spacious enough to hold training clothes, gym clothes, and travel clothes, as well as toiletries and lunch. It is made of 100% tough polyester and with strong stitches that keep it durable. There are two sizes of this backpack for the convenience of as many people as possible. It is primarily meant for sports. If you want a backpack for sports but you don’t really like this one, you can check my review on gym backpacks. Interestingly, a brand new Adidas Team Speed II Sackpack costs as low price. The SwissGear Travel Gear ScanSmart Backpack 1900 is made of 100% tough ballistic polyester fabric that makes it durable. It is combined with a large main compartment opened with ragged metallic zippers. It has adjustable side compression straps and a heavily padded back panel with an airflow technology to absorb shocks. It is a backpack with a great number of pockets, which means that it has a larger capacity than most backpacks. Its shape and design allow it to be used as a school backpack, a travel backpack, a flight backpack, and a hiking backpack. It is 18 inches high, 13.5 inches wide and 9 inches deep and can carry a laptop with the screen of 17 inches or less. The backpack can carry anything that you may wish to carry in a backpack because it has many pockets adapted to carrying different materials and objects. 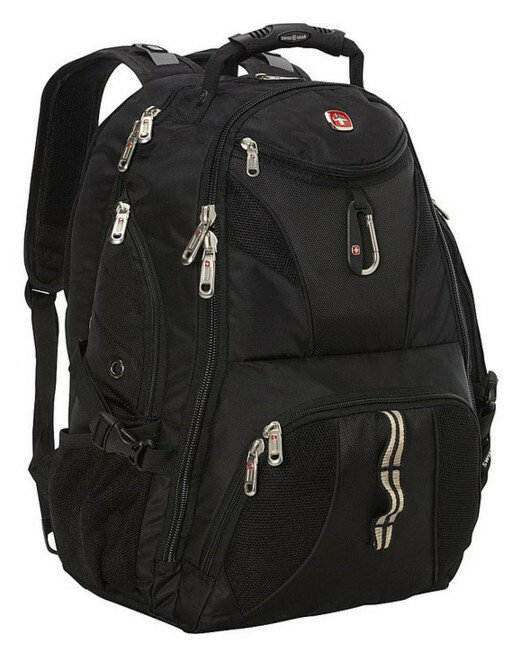 A brand new SwissGear Travel Gear ScanSmart Backpack 1900 would cost cheap and it is readily available upon request. A Kavu Rope Bag is a suitable choice for people who like to keep it simple. It is made of 100% force-10 cotton material from Canvas and is combined with an adjustable shoulder strap to fit any body size, two ventricle zip compartments for holding things like clothes, lunch boxes, and toiletries, and two small zip pockets for holding phones, keys, earphones and the like. It has a unique design that makes it stylish. There are many color varieties of the backpack, making it possible for you to choose your exact match. 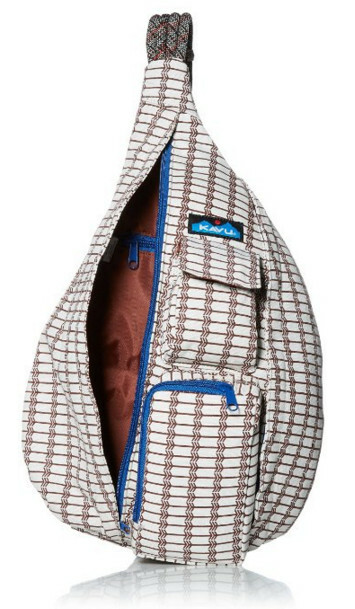 For a brand new Kavu Rope Bag, you will only have to pay few money and get a quality long lasting product. The J. World New York Cornelia Backpack is made of 100% polyester that makes it very durable. It is 12.5 inches wide, 19 inches high and 9 inches deep. This size allows it to carry a laptop with the screen size of up to 18 inches in the laptop sleeve. It has three main dual-zipped compartments to carry a multitude of different items, a small front pocket for carrying pens, phones, keys, earphones and the like, and a side mesh pocket for holding a bottle or snacks. Its straps are adjustable to fit many back sizes and they have a shoulder pad to evenly distribute the weight applied to the shoulders. The J. World New York Cornelia Backpack is simple and light, making it suitable for travel, hiking, and school use. A new J. New York Cornelia Backpack costs inexpensive and is always available for sale.